BUNN Flat Bottom Coffee Filters, 12-Cup Size, 250/Pack - Bunn Home Brewer Coffee Filters are designed so that every filter has the same structure and level of paper porosity. This ensures that every cup of coffee maintains the same great taste. 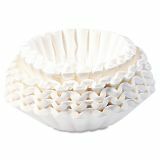 Both the box and the coffee filters are totally biodegradable and are tested to meet all FDA requirements.